A blog of activities relating to the J72 69023 'Joem'. This week we worked Monday afternoon to progress needle gunning the boiler barrel away from certain delicate ears. Arthur and John managed to clear about 20% of the barrel length, so it looks like all Mondays in March are going to be noisy. During the afternoon I managed to get a “buttermilk” gloss coat on the inside of the cab at the other end of the workshop. At about 17:00, Neal brought John Graham for what John described as his “annual visit to Hopetown”. He had a look at a few things with Neal, provided Neal with some advice regarding next steps with the loco, and left his thickness tester for Les Coughtrey. We also had a visit from Paul Hutchinson who has removed about half of the “K1 goods out”. He gave Arthur a fairly sizable turning job, which Maurice Bell managed to progress on Thursday. And then we had a visit from Terry Newman. Fourteen of us at Hopetown this Thursday. Andy brought in a packet of shortbread to accompany morning tea – much appreciated. Les Coughtrey spent the day making thickness measurements over the boiler. He’s a little concerned about what appears to be a small but systematic discrepancy between Mark O’Brien’s readings and those from John Graham’s instrument in areas of pitting. Since he’s going to be at Grosmont today, he intends comparing Mark’s instrument. This may be a head size effect. Paul Mason managed to remove old gasket material from the back head. The machinists spent the day turning pins for the K1 and turning spring hanger nuts. Derek Shorton and Steve Johnson managed to strip the paint from the other eccentric strap ready for NDT. Tim Williamson and Andy Bell managed to finish the dye penetration testing of the horn stays. Colin Smith and Allan Wilson almost completed cleaning between the frames. Harry Sams managed to dress both draw hooks, but there is considerable wear in one of the shafts which needs assessment. With the help of Colin Bowman, I managed to get some primer onto components which had been stripped for NDT, and passed. 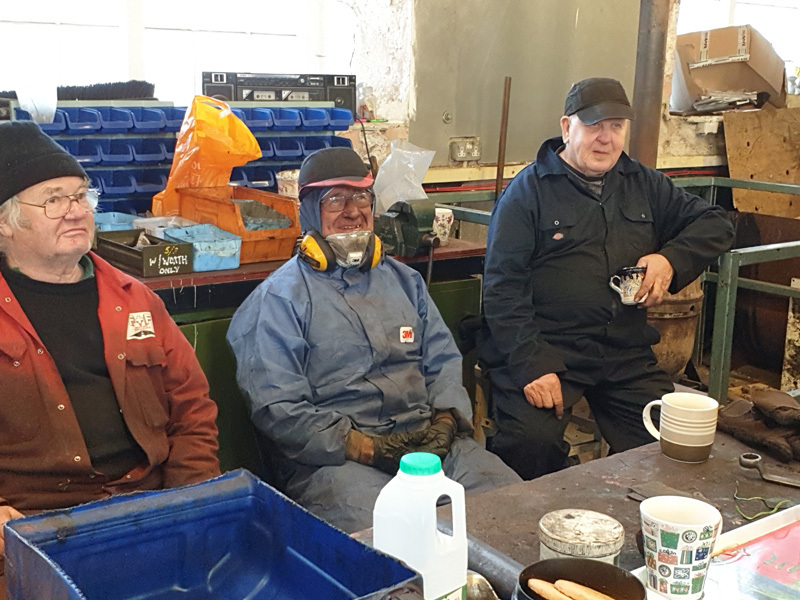 Tim Williamson spent the afternoon with his soldering torch chasing leaks around an oil feeder/can brought from Grosmont. Tea time was spent arguing as to whether the device is called a feeder or a can or a pourer. Some were losing the will to live! Fifteen of the usual suspects signed in; but we were also joined during the day by Les Coughtrey and a visit from Steve Hyman. Arthur and John got the main door open, dust supressing curtains in place, compressor in action and started needle gunning the boiler inside of the boiler barrel. There was even more noise from certain people complaining about the noise. We gave up needle gunning and will come in again on Monday to progress this. Arthur and John retreated to the lathe and continued with the spring hanger nuts. Colin Smith and Allan Wilson continued cleaning the frames around the motion. I stripped off spots of paint from the frame side of the tanks in preparation for thickness testing – looks like measles. My afternoon was spent applying another undercoat to the cab interior. Tim Williamson cleaned up the other coupling for NDT, then stripped the paint from the eccentric straps for NDT. Harry Sams fitted the blastpipe to the saddle to check the fit with the new studs and managed to grind the flanging from the brake blocks. Paul Mason ran the die nut down the studs in the back head bosses, though he feels having done so that most of these studs ought to be replaced. 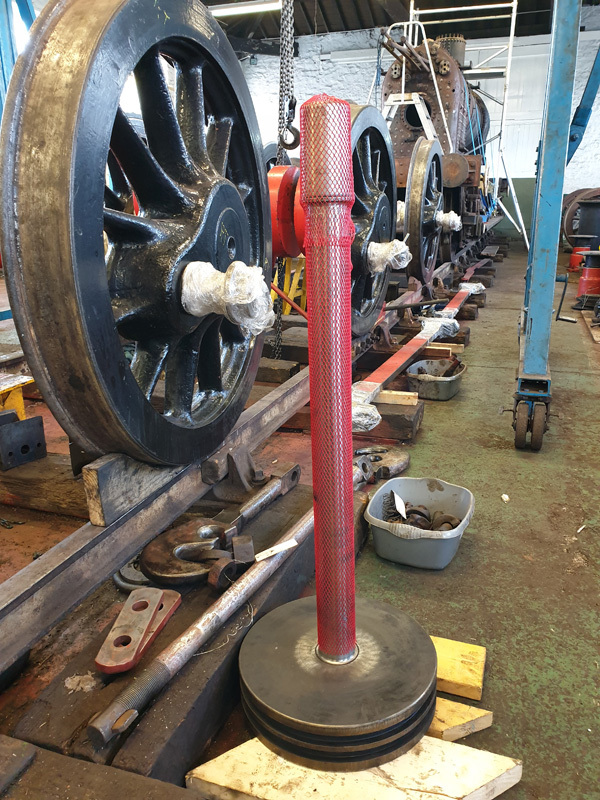 Andy Bell lapped in the non-return valves in the globe lubricators and with James Piercy managed to dye penetration test the RHS horn stays. Derek Shorton managed to saw much of the new firewood into lengths which will fit into the stove. Steve Gibson polished out the marks from the radii of the LHS big end crank pin. The RHS radii were polished but there is a lot of water damage to the journal which could not be removed with emery cloth. Both journals have been re-greased. Les Coughtrey arrived mid-morning after another appointment and continued working through the NDT list. Roy Marshall joined us later, though had a number of “secretary” things to do and people to see. He remarked that vegetation seemed to be springing into life again outside and that it may be time to tame the jungle again. After allocation of the work from the job list, Richard Starrs from Darlington Borough Council (Project Manager, Stockton and Darlington Railway Heritage Action Zone) and a prospective historic building surveyor arrived for a quick visit. After that I had a trip to the shop for milk and biscuits, Smith and Allen for supplies and to M-Machine to collect a box of steel blanks which Neal Woods had ordered (currently on machinists bench). Steve Gibson dismantled the big end straps for NDT, then got on with the ash pan. John Jones and Paul Mason extracted the slide bar bolts for NDT. Colin Smith and Allan Wilson continued cleaning the front section of the frames, but with John and Paul above, things were a little crowded. Tim Williamson finished cleaning the eccentric rods for NDT, then set about the couplings. He also slackened the eccentric straps 1 & 4 in readiness for NDT. Harry Sams fitted the new studs into the saddle but I don’t think managed to trial fit the blast pipe. Maurice Bell was busy on the Harrison lathe and Arthur now has the Colchester lathe back together. Roy Marshall arrived after lunch and discussed some guarding issues with the machinists. Andy Bell discovered that a steam heat valve shaft was badly bent and would need replacing. He’s found a suitable piece of brass for Maurice or Arthur to turn. We may need to source a tiny spring for this valve. Colin Bowman did a fine job of tidying the workshop for the weekend. A good day’s work all round, bit things don’t look very different. Twelve signed in to work on the J72 on Thursday. There were complaints about lateness of mid-morning tea. The NELPG clock by the fire has slowed down – we have yet to determine if this a relativistic effect or the need for a replacement battery. Tim Williamson managed to tack another piece of channel to the wagon to constrain the feet of the tower. John Jones managed to continue cleaning the frames behind the cylinder block . Tim managed to prepare three of the eccentric rods for NDT. Steve Gibson straightened out the ash pan which is fit for service other than a couple of pins which need renewal. Derek Shorton and Andy Bell worked on the steam heat valves. John Midcalf delivered the refurbished pistons which James Piercy measured up. James also looked at the Bridgeport Miller whilst Maurice Bell continued with his production run on the Harrison lathe. Nigel Hall managed to get a coat of white undercoat onto the inside of the cab. After lunch, Arthur managed to sweep out the boiler barrel and to start needle gunning. Paul Mason assisted by hauling up the buckets of scale. It’s nice to see progress in this area at last.